Did you miss me? I still can’t believe it’s been a month since I’ve posted a recipe here, especially considering I’ve been baking like a crazy person lately. Unfortunately it was just tried and true recipes as I didn’t want to experiment for Rosh Hashana and Yom Kippur break-the-fast desserts. Speaking of Rosh Hashana, my mom bought a Costco-sized bag of M&Ms to fill candy dishes with when we had 40 (!!) people for dinner at our house for the holiday. Fortunately for me, there was a ton of candy left and I took it home so I could make these cookies. 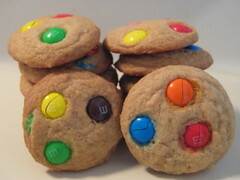 As a kid, I always loved the chewy, buttery M&M cookies from the bakery. While these do not live up to my childhood memories, they are good nonetheless and I know my coworkers will gobble them up in no time tomorrow. In a large bowl, mix sugar, eggs, shortening, and vanilla thoroughly. Add flour, salt, and baking soda to creamed mixture. Blend well. Add 3/4 cup of M&M candies. Drop dough by teaspoonful onto cookie sheet. Slightly push a few candies on top of each dough ball with remaining candies. Bake at 350 degrees F (175 degrees C) for 9 to 11 minutes, to your liking. mmm…sounds delish. i might have to break out of my chocolate-oat-chip mode to try these…. I think I may just have to make these… when I was a kid they were my favorite, I used to call them party cookies, because my mom bought some for a class party when I was 4. Still to this day they have to be one of my fav treats. I made these the other day with Halloween M&Ms. I’m really picky about M&M cookies and these were great! I underbaked a few batches and left them on the cookie sheets a little longer when cooling. They can out crispy and chewy. Delicious! I think I’m going to make these tonight to add to my holiday baskets. I’m excited they look so good. I’ll let you know how it goes!